Nationally, around 75,000 young people become homeless each year in the UK and that number is increasing as pressure on housing and services grows. 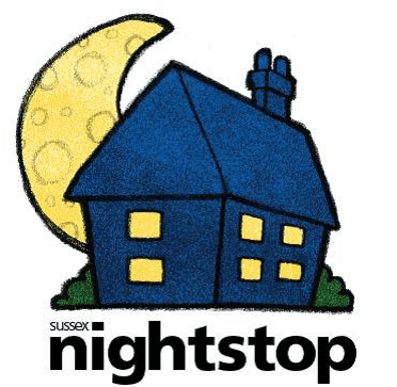 Nightstop provides an emergency housing service for 16-25 year olds who are at risk of homelessness, The service aims to prevent ‘sofa surfing’ and the subsequent risk of homelessness and rough sleeping, by offering vulnerable young people suitable emergency accommodation provided by approved volunteer hosts within the community. Sussex Nightstop is affiliated to Depaul UK using their Depaul Nightstop UK, model. De Paul UK is the UK’s largest charity for young homeless people. Nightstop is a community response to a problem which is all too common in our community. This unique service is made possible by the generosity of inspirational people with a spare room and a desire to make a difference in a young person’s life. Sussex Nightstop trains and supports volunteers to become ‘hosts’ who then offer a room in their homes to a young person. Referrals are made from local agencies (YMCA – social services etc) to the Nightstop co-ordinator who matches the young person with a suitable host for a minimum of one night. Hosts receive expenses to cover the costs of food, toiletries etc. and specialist help from social and housing workers. The cost of providing a single night’s accommodation is around £25. That covers administrative costs, host expenses (including training); a bus ticket for the young person. Depaul Nightstop UK believes that in every community there are ordinary people who want to reduce the problems associated with homelessness amongst young people. Volunteers can help local Nightstop services by becoming hosts if they have a room that can be used to provide a bed for a night. There are other ways to help directly by being telephone contacts, drivers, or meeting and accompanying the young person to make sure they find their way to their host safely. We could raise enough money to provide safe shelter for one young person every night for a year? ………recruit 10 volunteer hosts or befrienders? Get thinking and planning – there are many interesting ways to raise money and awareness at the same time as having fun! !